Can’t. When I was asked to share my story as we prepare for Walk With Me 2015, the one word that kept coming back to me was can’t. My name is Bill Barnes and when I was born I was diagnosed with Cerebral Palsy. You see as I was growing up my Dad would often say to me that can’t wasn’t in the dictionary. His point to me was that he didn’t want to hear me say I ”couldn’t” do something. Since most of the times he said this I was in the midst of doing exercises and physical therapy, I was not too fond of that saying! Over many years I realized that he was hoping to set me up for a lifetime of success. I never really looked to see if can’t really was in the dictionary, but I have a sneaking suspicion it was! So at some point I realized it’s not what you can’t do that’s important it’s what you can. Much of that was due to my parents, but the other part to that equation was Easter Seals. I began at Easter Seals as a very young child in the preschool program and also participated in the summer camp program. I also received much more physical therapy than I ever wanted. What I know now is what I can do in my life today has a lot to do with what Easter Seals did for me when I was younger. If they hadn’t pushed me who knows if I’d be a middle school teacher like I am today. As I got older I began to understand what Easter Seals did for me and I wanted to give back to them as much as I could. Eventually, I became a camp counselor and a Camp Director for Easter Seals. I got to see firsthand how the therapists and teachers at Easter Seals are still striving to show children what they can do. I got to see how they work with each individual child to make sure they are the success that they can be. Just as importantly, I got to do the same for scores of children through the summer camp program. While the camp program no longer exists the magic of social media allows me to see the successes “my kids” have become. We all still call ourselves the Easter Seals family. Just this past week, two things happened that reminded me how important Easter Seals has been in my life. I recently reconnected via social media with one of my first physical therapists. While wishing me a happy birthday she reminded me how much I “loved” coming to see her. None of the messages I received meant more because I know what she meant to my life. Then later in the week while at an alumni weekend event at my alma mater, Temple University, I was stopped in the middle of campus by a former camper of mine. I absolutely beamed as he told me of the great things he was doing. 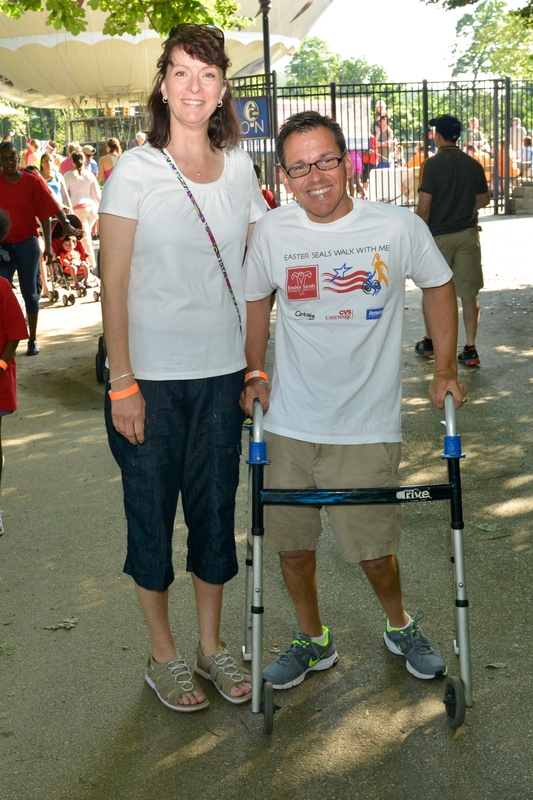 I participate in Walk With Me each year because I have seen and been a part of the great work that Easter Seals does. The therapists, teachers, social workers and many others care so much about the children they work with. Their number one goal is to focus on what each child can do – and I know that someday they will look back with pride seeing the successes those children have become because of the work they do. Take it from me, there is no greater feeling! This entry was posted in child stories, General info and tagged cerebral palsy, Early Intervention, Easter Seals, Easter Seals of SEPA, Easter Seals of Southeastern Pennsylvania, physical therapy, volunteer, Walk With Me on April 28, 2015 by Easterseals.